This is really well done! From the basic levels introducing mechanics to the more puzzling levels, it all just worked. I finished the 8 levels, but could definitely go back to optimize my run. With a bit more packaging and a bunch more levels, this would make a legit puzzle game on some form of for-profit game-selling platform. Fantastic job! Would have been interesting to play around with the stickiness a little more and have to stick the blocks together in an 'L' shape, for example. That was some solid puzzle design for a game jam, good job. Nice! Effective use of simple mechanics that made it engaging to figure out the right order of steps to solve the puzzles. Awesome game! The theme is implemented splendidly and the puzzles are clever but not frustatingly hard to solve. A quick, relaxing bit of fun! The only "bad" thing that it is pretty short, so I hope the game will be extended after the game jam. Thanks for the positive feedback, and good job on completing every level! It's quite fun to create levels, so I might update the game with more. 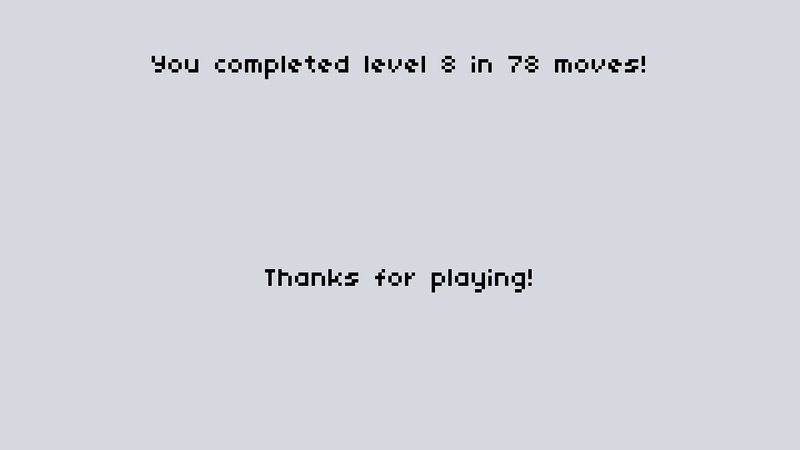 I have done level 8 in 60 moves but 78 is pretty good! Great use of simple mechanics for puzzles. Some sound would have bee nice to complete the experience.